DUNES ROAD!! CLOSEST TO THE BEACH!! GREAT VIEW!! NOW BOOKING SUMMER 2019!! Spend your vacation across the road from the boardwalk onto RI's best private family beach. Location, location! This home is a recently renovated cottage on Dunes Road. Enjoy the simple charm of yesteryear combined with modern luxury and the privilege of one of the most enviable locations in Narragansett. The views are great from the deck and the front of the house and the convenience of walking steps to sandy Kelly Beach and back are tantamount to privlidge in every aspect. There is a large, private yard and many areas of quiet retreat to relax in the sun when not on the beach. Sit and watch the sun set brilliantly over the water from your private, screened porch in the front, or take the family for a walk along the breathtakingly beautiful cliffs of Bonnet Shores and Bonnet Point. No matter what your vacation plans are, you will have the best advantages here in the heart of it all! The beach is located just steps away from your door and is a private beach for Bonnet residents and renters only. Every morning the sand is combed for your enjoyment and you will experience one of the finest private beaches in New England. 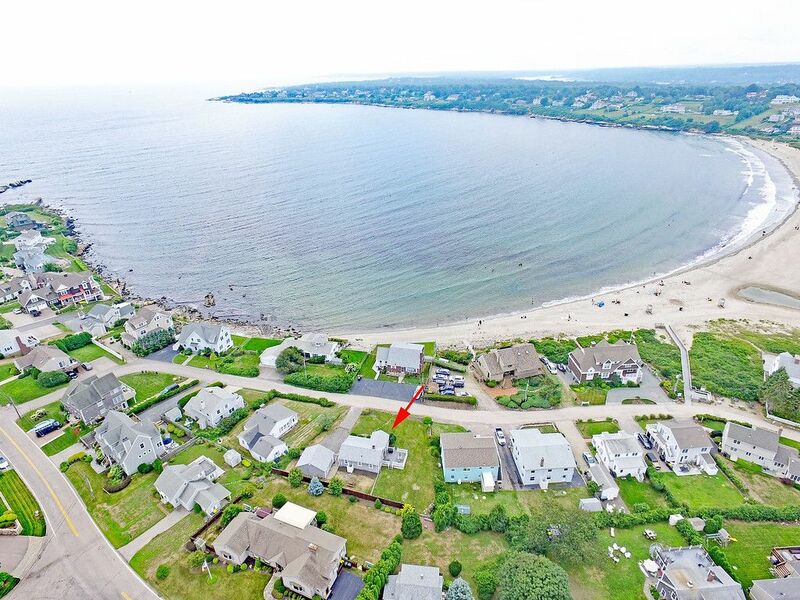 Bonnet Shores is the most enchanting beach and boat community in all of South County, Rhode Island. Walk, jog, or bike the 5 kilometer loop through Bonnet past breathtaking views of the beaches. Experience the charm and ambiance as you view the sparkling lights of the Jamestown and Newport Bridges across the water in the evenings. All shopping is located a short drive down 1-A including supermarket and liquorstore, gifts and antiques. There are many fabulous restaurants in the area to choose from offering a full range of cuisine. And the fresh seafood!! The town beaches are located 10 minutes away, and the Narragansett Pier section offers many additional shops and restaurants. Waterfront dining here is in abundance. Fantastic beach views from the deck and the front of the house! Nice ocean views from the deck and the front of the house. Great location, steps from awesome Kelley Beach. Perfect for family vacation. I stayed here with my 87 year old mother, my brother, and three kids ranging from 10 to 14. The convenient location meant that everyone could go back and forth to the beach as it suited them. House is simple but comfortable, with a great outdoor shower and plenty of lawn to play on. Back deck is wonderful for lounging on or eating dinner. Owner is very easy to deal with. Thank you for the great review David! Convenience and simplistic beach charm are exactly what defines our home. I'm so glad you had a chance to visit and hope to see you again in the future! Cottage was clean and the view was amazing! We enjoyed being close to the beach. UPDATED RESPONSE: NEW KITCHENWARES PLACED IN SERVICE AND CONTINUE TO BE UPDATED REGULARLY. FULL-SIZE MATTRESS REPLACED AS WELL AND FEEDBACK HAS BEEN FANTASTIC. We had a great week at this property with many memories made with our 3 and 4 year old children. It is the perfect location and close to a very calm beach which suited our family well. The house was small but clean and well maintained and appropriately supplied with the cooking utensils and supplies we needed. However, it was extremely disappointing in the sense that the two larger beds and the couch were miserably uncomfortable. Not having a comfortable place to sleep or sit and relax after long days on the beach was frustrating to say the least. If the furniture were updated we would consider returning to the property. UPDATED RESPONSE: ONE OF THE MATTRESSES AND COUCH WERE 2 YEARS OLD AT THE TIME OF THIS REVIEW, SO AS OWNERS WE WERE DISAPPOINTED TOO!! AS OF SPRING 2017, A NEW FOLD-OUT COUCH WAS PUT IN SERVICE AND 2 MATTRESSES HAVE BEEN REPLACED. THOUGH NOT MENTIONED, LAST MATTRESS TO BE REPLACED IN 2018. Our family really enjoyed our stay on this property close to the beach. This week was perfect for us to spend a week together with our two daughters who live in Florida and the other in Colorado. Our two year old grand daughter had a great time at the beach. Her first experience. Easy short walk to the beach. We had a very hot week. Even though the home didn't have any air conditioner, it was always breezy and the evening cooled down which made it comfortable. Yard has lots of room to play games for adults or children. Fireplace outside for evening. Beautiful neighborhood and quiet location. Hope to return soon. We loved Narragansett. Enjoyed Newport and a day trip on our boat by Point Judith. Owner is always available if needed. The most memorable day on our vacation was, one of our daughter was married on the last day of vacation 10 minutes away. A vacation to remember. This house was very clean perfect location to Kelly beach just steps away. We had a great week. The yard is huge where our kids could run around and play! Very nice deck with water views. The ocean breeze at night keeps all the rooms comfortable and cool. This is the first of many years of memories for our family I'm the future. The owner was very accommodating as well answering all the questions I had about the property. I recommend this rental to anyone.